1. Pinch to Zoom. This is probably what most are familiar with and comfortable doing. This will work in Mail, Photos, Safari, PDFs in iBooks, Apple Maps and Google Maps. 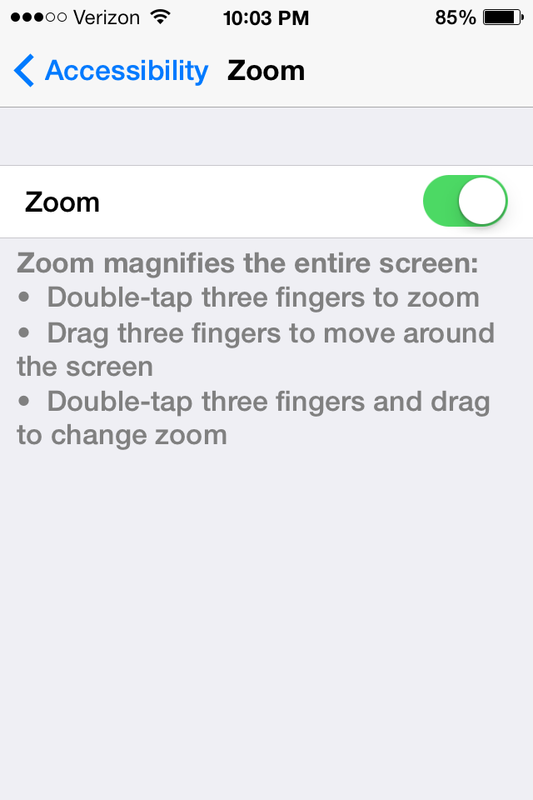 To Pinch to Zoom, you start with two your fingers close together on the iOS device. I typically recommend the thumb and pointer finger. Then, if you spread your fingers apart, the content gets bigger underneath. You can do this gesture several times to get the content bigger so that way it is easier for you to read. 2. Smart Zoom. This is probably the second most popular way to get the content bigger. This will work in Mail, Photos, Safari, Apple Maps and Google Maps. Wherever you want the content to appear bigger, double tap on the display with one finger. The content automatically appears bigger and it is zoomed in so it fits evenly on the display. You do not have to adjust the screen or move the content around on the screen. It automatically fits in. 3. Large Text/Text Size/Larger Type. 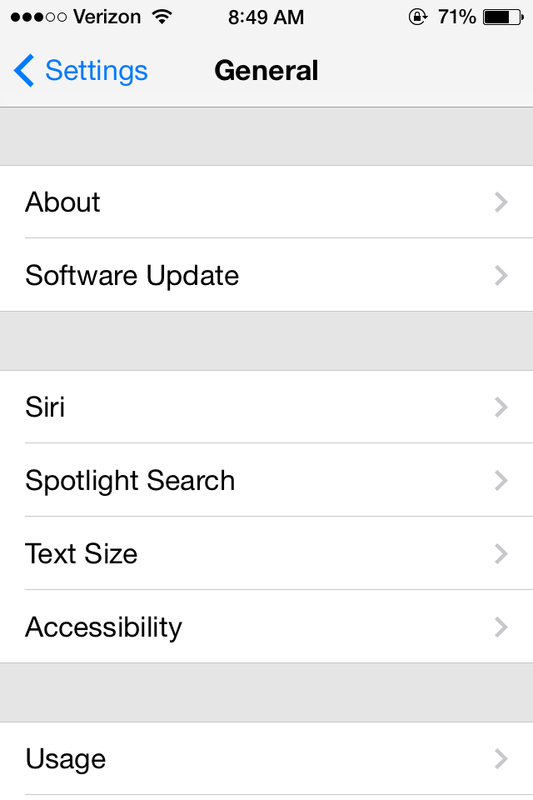 This feature changed with iOS 7 (here’s how it works in iOS 6). You will go to Settings, and then General. Click the Text Size button. When you press Text Size, down on the bottom you have a slider which you can use to adjust the font. 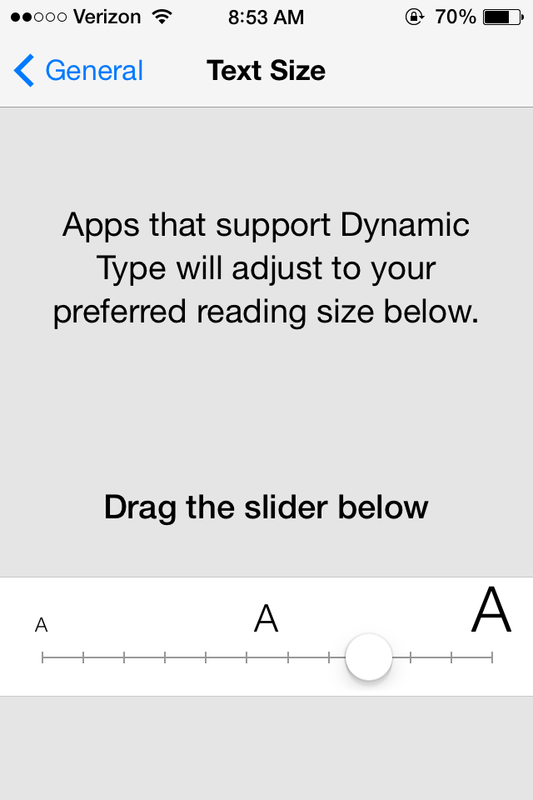 Adjust the slider to the right to make the font bigger, and adjust the slider to the left to make the font smaller. If you actually go into Accessibility there will be a button that says Larger Type. 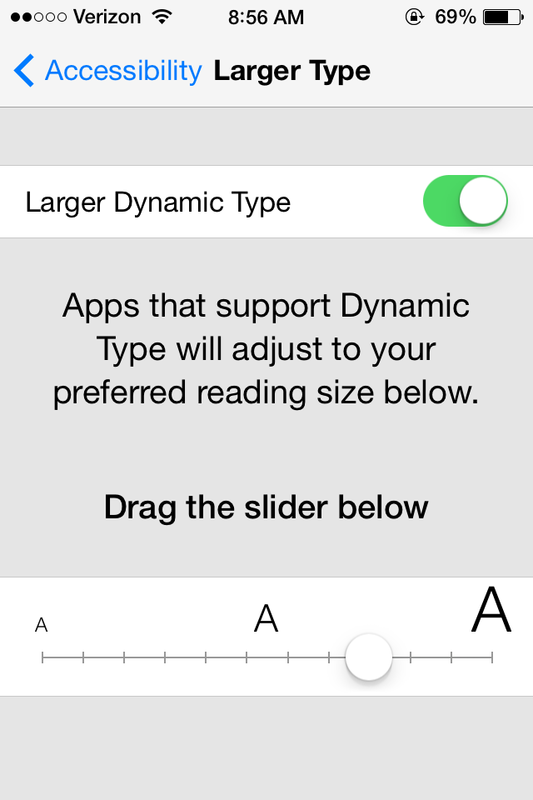 Developers now have the option to have the font size be controlled by this setting. So not only will this Larger Type work in Mail, Contacts, Calendars, Messages and Notes like it does in iOS 6, but for any developer who enables Larger Dynamic Text, the text size in those apps will change to the user’s preference. 4. Zoom. This form of zooming I affectionately call 24/7 zooming because with this zoom, you can zoom where ever you want to. Be it on the Home Screen, the Settings app, in the App Store to read the App descriptions, word games, cooking apps, etc. It just works. Go to Settings, General and Accessibility. Tap on Zoom and slide Zoom on. Now to actually Zoom on the screen you would Double-tap with three fingers. To Zoom out Double-tap with three fingers. You can increase the magnification of the Zoom to 500x. The easiest way to do this is to start at minimum zoom (the default setting). Then when you when Double-tap with three fingers, hold and slide up. Your preference is saved so when you Zoom with this method, it will Zoom to your preferred setting. When you are zoomed in, you will drag with three fingers to move around the screen. 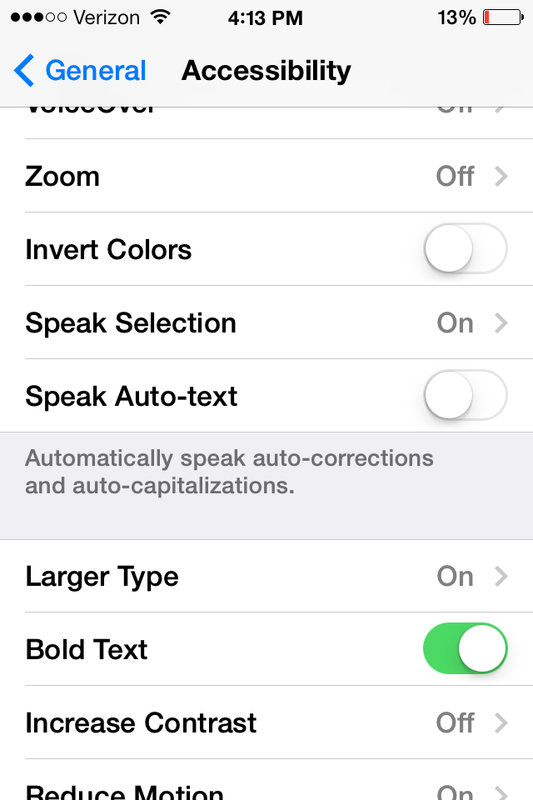 New in iOS 7, you have the capability to turn on Bold Text and Increased Contrast. Note: my screenshots are done with bold text. Applying this setting will restart your iPhone. Improve contrast on some backgrounds to increase legibility. Typically, you will notice the changes in the contrast when you are using Assistive Touch, Notification Center, Siri and in Private mode in Safari. With Increase Contrast off, those overlays are a see through grey. When you turn on Increase Contrast, it turns those overlays black. Hopefully these tips and tricks will help you enjoy reading and enjoying content a lot more on your iOS device.